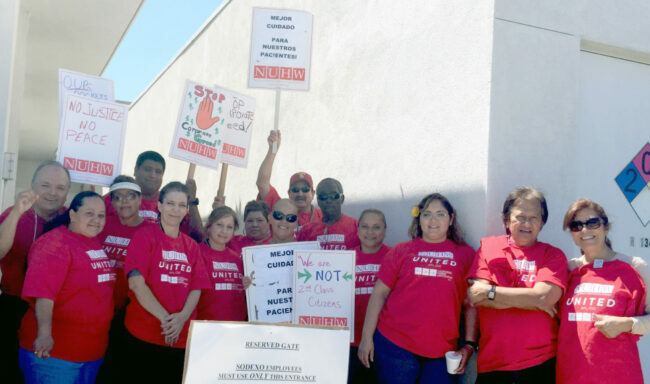 Sodexo-Los Alamitos Medical Center agreed to meet NUHW members’ demands just minutes before the workers were set to launch an informational picket at the facility April 29. For months workers have expressed a number of concerns that have gone unanswered by management: HR has shorted workers on their paychecks and dragged their heels in correcting the errors; management has been violating by safety standards by having the same employee handle trash, including biohazardous materials, and clean linens; management has failed to provide adequate staffing to cover vacations and other absences; and managers have retaliated against workers for their union activity and for speaking up for improved patient care and working conditions. • Schedule a meeting to address incorrect paychecks and HR’s behavior in dealing with these issues. • Bring in another employee so that one person isn’t handling both the trash and the clean linen. • Work with us to make sure that there is adequate staffing to cover for vacations and other absences. • Work with us to ensure that workers do not face retaliation for union activity or for speaking up for improved patient care and working conditions and that all workers are treated with dignity and respect.